in line with the exhibition of a 15,000 year old woolly mammoth in marina mall in abu dhabi, we developed the in mall campaign 'mammoth sized gelati’ for rita’s. to kick off their presence on justgiving.com, ews-wwf asked us to create a campaign for the festive season, which resulted in the online activation 'give earth a gift that count$'. when rita's opened in the uae, they asked us to create a flyer for free gelati. we came up with the idea of the 'smell me!' flyer: a vanilla scented, actual size, ice cream shaped flyer that makes you want to try the real rita's gelati. 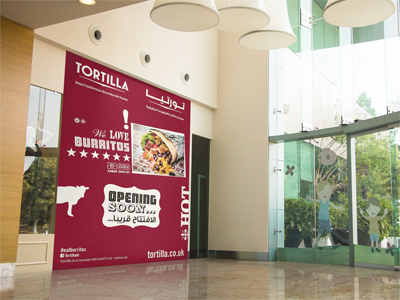 for the launch of the first tortilla in the uae, we created the opening soon visual for the store hoarding in festival city in dubai. for the launch of the first tortilla in the uae, we developed all the opening visuals for the in mall campaign in festival city in dubai. every year ews-wwf thanks their corporate members with a thank you ad. this time they wanted to do something different by highligting the members names. we created this visual for them, where all the corporate member names are used to create the background.